Calcination or calcining is a thermal treatment process to bring about a thermal decomposition. The process takes place below the melting point of the product. The name calcination is derived from the Latin word ‘Calcinare’ which mean to burn lime. Limestone is a naturally occurring mineral. It exists nearly all over the world. The chemical composition of this mineral varies greatly from region to region as well as between different deposits in the same region. Therefore, the end product from each natural deposit is different. Typically limestone is composed of calcium carbonate (CaCO3), magnesium carbonate (MgCO3), silica (SiO2), alumina (Al2O3), iron (Fe), sulphur (S) and other trace elements. Limestone is one of the most basic raw materials employed in the steel industry and is used both in iron making and steel making processes. Lime (CaO) is one of the oldest chemicals known to man and the process of lime production is one of the oldest chemical industries. Quicklime was produced in US as early as 1635 in Rhode Island. Technical progress which was non existing in centuries past, has rapidly advanced the lime industry during the last fifty years in the area of process methods and design. High calcium – The carbonate content is composed mainly of calcium carbonate with a magnesium carbonate content not more than 5 % (usually less). Magnesium – This contains magnesium carbonate to about 5 – 20%. Dolomitic -This is also known as dolomite and contains over 20 % of MgCO3. However the maximum MgCO3 content does not exceed 45.6%. The balance amount is calcium carbonate. Limestones from different sources differ considerably in chemical compositions and physical structures. The chemical reactivity of various limestones also shows a large variation due to the difference in crystalline structure and the nature of impurities such as silica, alumina and iron etc. The varying properties of the limestone have a big influence on the processing method. Hence it is necessary to know comprehensive information of the limestone such as physical and chemical properties, the burning characteristics and kinetic parameters for the calcination of the limestone. This aids optimal design and operation at lime kilns. The standard Gibbs free energy of reaction is approximated as ?G°r = 177,100 ? 158 T (J/mol). The standard free energy of reaction is zero in this case when the temperature T is equal to 1121 K or 848 deg C. Hence the chemical decomposition reaction for pure CaCO3 will start at 850 deg C.
Calcination of calcium carbonate is a highly endothermic reaction, requiring 755 M Cal of heat input to produce a ton of lime. The reaction begins when the temperature is above the dissociation temperature of the carbonates in the limestone. This typically is between 850 deg C and 1340 deg C. Once the reaction starts the temperature must be maintained above the dissociation temperature, and carbon dioxide evolved in the reaction must be removed. Dissociation of the calcium carbonate proceeds gradually from the outer surface of the particle inward, and a porous layer of calcium oxide, the desired product, remains. The following factors affect the calcination. Crystalline structure affects the rate of calcination, internal strength of limestone and resultant crystal size of lime after calcination. The smaller crystals agglomerate during calcination and forms larger crystals which in turn cause shrinkage and volume reduction. Calcination at higher temperature means higher agglomeration and more shrinkage. Also the density of limestone is related to the crystal structure. The shape of crystals determines the void space between crystals, and hence the density of the limestone. Larger voids allow easy passage for CO2 gases during calcination and it results in a reduction of volume during calcination. Some limestone, due to its crystalline structure, disintegrates during the calcination process. This type of limestone is not useful for calcining. There is some other limestone whose behavior is the opposite. This type of limestone become so dense during calcination that it prevents the escape of CO2 and become non porous. This type of limestone is also not suitable for calcination. The smaller size limestone is more suitable for calcination in rotary kilns and it allows optimum residence time. The lower calcining temperature also allows less fuel consumption. In contrast, larger size limestone and low calcining temperature is needed for vertical kilns. If the temperature rise is too rapid, the outer layer of the limestone pieces is calcined very fast. As the temperature rises, the surface of the limestone shrinks and closes the pores created by the escape of CO2. This causes increased internal pressure within the limestone. Since the CO2 gas cannot escape, the limestone explodes and disintegrates producing unwanted “fines” thus reduces the quality of the lime. The production of good quality lime depends upon the type of kiln, conditions of calcination and the nature of the raw material i.e. limestone. At relatively low calcination temperatures, products formed in the kiln contain both unburnt carbonate and lime and is called ‘underburnt’ lime. As the temperature increases, ‘soft burnt’ or ‘high reactive lime’ is produced. At still higher temperatures, ‘dead burnt’ or ‘low reactive lime’ is produced. Soft burnt lime is produced when the reaction front reaches the core of the charged limestone and converts all carbonate present to lime. A high productive product is relatively soft, contains small lime crystallites and has open porous structure with an easily assessable interior. Such lime has the optimum properties of high reactivity, high surface area and low bulk density. Increasing the degree of calcination beyond this stage makes formed lime crystallites to grow larger, agglomerate and sinter. This results in a decrease in surface area, porosity and reactivity and an increase in bulk density. This product is known as dead burnt or low reactive lime. The most popular vertical kilns are PFR (Parallel Flow Regenerative) type. 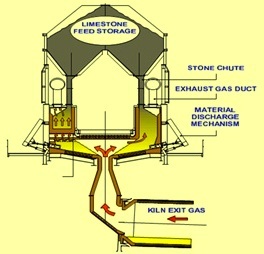 Different types of kilns for calcining limestone are shown in Fig 3. Various features of these kilns are tabulated in Tab 1.